Think Winx, ten lengths ahead with 200 to go. Usain Bolt with 20 metres on his nearest rival. Australia, batting first against South Africa in Johannesburg in 2006, had just taken the Proteas to the cleaners. In a batting masterclass never before seen in white-ball cricket, Ricky Ponting (164 off 105) led his side to a world-first score of 4-434. Never mind the fact this was the deciding clash in an enthralling series tied at two-all, Australia had scored in excess of 400 – long seen as the unattainable pinnacle of the 50-over format. A few sides had come close over the years. Sri Lanka had scored 398 against Kenya in 1996, while New Zealand and England had scored 397 and 391 respectively in 2005, against Zimbabwe and Bangladesh. But there was a common thread in those: each of these were against (at the time) cricketing minnows. Few people thought it possible to score 400 against one of the top cricketing nations, not least in an extremely close series whereby the four previous games hadn’t even seen a score in excess of 300. So with that in mind, you’d forgive the engravers for getting a head start on their work that afternoon. You’d also forgive me, then, for going to bed at that exact point. Please do, because I haven’t forgiven myself. It’s been called ‘the greatest one day international ever played’. 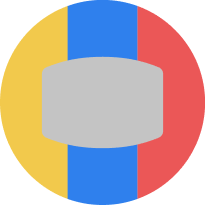 The ‘438 game’. Whatever you refer to it as, I missed it. Being nine hours ahead, the Australian innings at The Wanderers finished at around 11pm our time, and bed was calling. I had just witnessed one of the most satisfying innings as an Australian cricket fan, where records tumbled and balls were continually launched into the stands. Fourteen, in fact, cleared the rope. No side had ever lost after hitting that many sixes in an innings. But then again, no side had lost after doing a lot of things Australia did that afternoon in Jo’burg. I told myself that I would wake up a resounding victory, and whatever score South Africa could muster was just a number. A losing number. The fact was, the series was won, and the cricketing Everest of 400 had been smashed. Happy days. 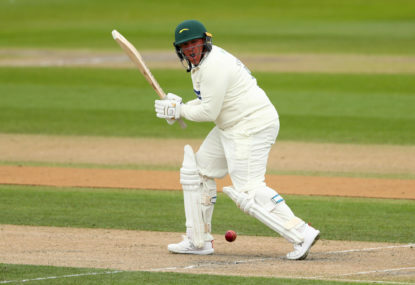 Mike Hussey – who had been promoted to number four and scored a brilliant 81 off 51 that afternoon – said the side didn’t really know what to do in the innings break. “John Buchanan (Australia coach) had been challenging our team to get to 400 in a one-dayer for a number of years, and we’d not believed him that we could do it,” Hussey said, recalling the day. In a nutshell, Simon Katich (79 off 90) and Adam Gilchrist (55 off 44) got the tourists off to a perfect start at ‘The Bullring’ in what Hussey described as “perfect conditions for batting”. Added to the bowlers’ woes was a short boundary on one side, something Ponting would take full advantage off. The Aussies passed 200 at the 28.5 over mark, and the old adage to ‘double your score at 30 overs’ meant 400 was clearly in play. After clearing the fence nine times, Ponting would see his side past 400 with three overs to play. Some lusty hitting from Andrew Symonds (27 off 13) and Brett Lee – yes, the quick was promoted ahead of Damien Martyn and Michael Clarke in a lovely footnote to an already brilliant day – saw them to a fairly handy 434. Opposing skipper Graeme Smith details how, much like the Aussie dressing room, the Proteas’ rooms were in a state of disbelief. Without any idea of how to approach their ensuing innings, one veteran’s joke broke the considerable tension in the room. 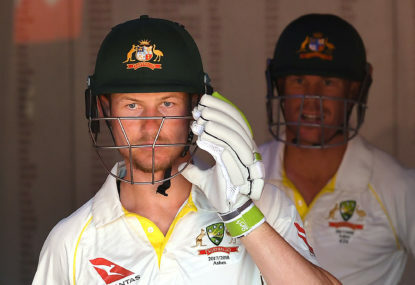 “I remember going up the stairs to the changeroom, sitting down and I start getting into batting mode and about five minutes after that, the changeroom was quiet,” Smith said. “Jacques (Kallis) walked up the stairs and he said, ‘Guys, I think we’ve done a good job, I think they’re 15 runs short’. The ensuing laughs were, as Smith recalls it, the ice-breaker everyone needed. 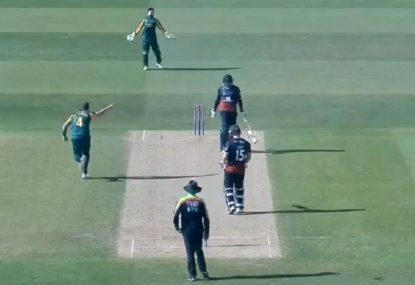 Smith’s opening partner, Boeta Dipenaar, was skittled in the second over as a collective sigh went over the Wanderers. 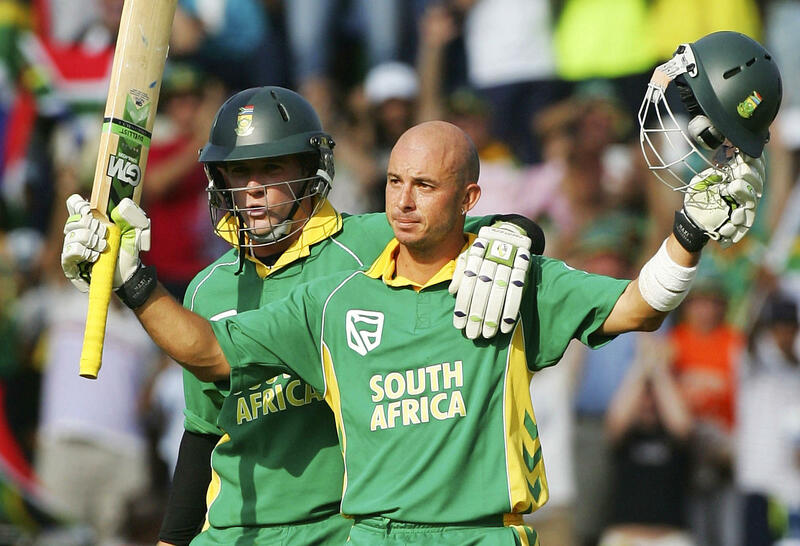 Enter Herschelle Gibbs who, along with Smith, then went about completely dismantling the Aussie attack. The pair put on 187 before Smith departed in the 23rd over. But as incredible as the second-wicket stand was, they weren’t yet halfway. Gibbs’ hitting was perhaps best characterised in his next partnership. Paired with the not-too-shabby-himself AB de Villiers, the pair put on 94 in 52 balls. But de Villiers only scored 14 of them. “We always thought if we could get Herchelle, then we could definitely slow them down,” Hussey said. 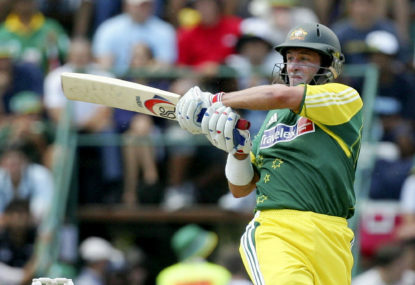 Gibbs eventually departed with 175 off 111 balls – one of the finest ever one-day knocks and one that would come to define his legacy, rather than a certain dropped catch in the 1999 World Cup. But the Proteas still required another 136 to win. An anchoring 50 from Mark Boucher and some incredible late order hitting from Johan van der Wath (you’re doing well if you remember that name) eventually saw them home with a single ball to spare to unimaginable scenes in Jo’burg. It was the chase to end all chases. 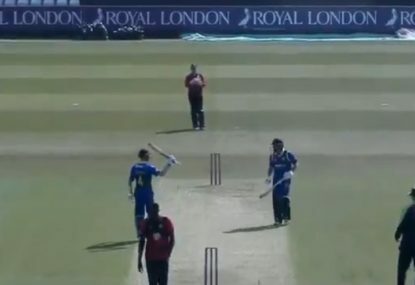 A level of hitting that, up until that point, was unseen in world cricket. And yet I missed it. I don’t, however, think I was the only one. Foxtel are giving away a 12-month Platinum HD subscription so you won’t have to miss out on any cricket this summer. To enter the competition, simply leave a comment telling us what great Australian cricket moment you missed and why. Terms and conditions can be found here.